It's true -- no question is a bad question. If you have questions, we want to answer them. CSU-Global’s Undergraduate Certificate in Cyber Security* is ideal for the IT professional or someone interested in the IT field. If you understand the importance of data and network security in today’s digital world, this nationally recognized certificate could take your career to the next level. 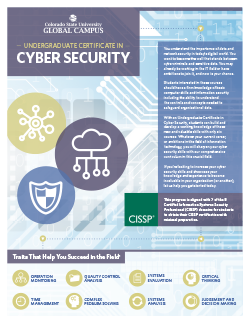 The Undergraduate Certificate in Cyber Security is a stand-alone, transcribable certificate the demonstrates your proficiency in cyber security. The certificate you earn at CSU-Global is recognized nationally by educational institutions and professional organizations. The Graduate Certificate in Cyber Security* is a stand-alone, transcribable, nationally recognized certificate. This accelerated program is designed for people who believe that organizations and individuals have a right to keep their digital information secure in today’s global infrastructure. With this certificate, you can become the digital protection people and businesses seek out to keep their sensitive information out of the wrong hands. Within the program you’ll gain the advanced knowledge and skills you need to secure data and protect assets. * This certificate is eligible for Title IV financial aid. Our rates haven’t risen once in 7 years. We charge the same for in-state and out-of-state students. Tuition rates won’t change as long as you’re a student. No student fees, no hidden fees. At CSU-Global, we know it’s pretty hard to climb up the career ladder when you’re weighed down with student debt. That’s why we haven’t raised our rates in seven years. We’re committed to staying affordable and putting education before tuition. Complete your degree on your own schedule. Access student support and any resource online. The life of a modern learner is a juggling act. When you’re juggling a full-time job and a family, we know it can be easy to drop the ball on your education. But with our flexible, 100% online system, we’ve set you up for success. Complete your schoolwork on your work breaks, after the kids go to bed, whenever -- earn your degree from anywhere, on your own schedule. We’re regionally accredited by the Higher Learning Commission. Our business programs are ACBSP-accredited. 84% of our faculty hold a terminal or doctoral degree. CSU-Global is not just any online university. We’re regionally accredited by the Higher Learning Commission, and our business programs are ACBSP-accredited. With a world-class faculty and programs designed to bring students career success, it’s no wonder that 95% of our alumni would refer a friend or family member to us. "My student experience at CSU-Global has been great. My academic advisor reaches out to me and is very responsive to my questions. The online format works well with my learning style and is easy to navigate."